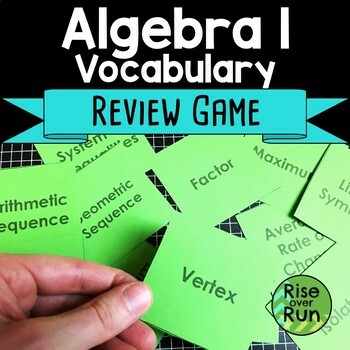 Review Algebra 1 vocabulary terms with a fun game in the format of Quiz Quiz Trade! 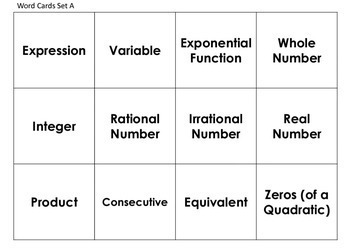 This game will get students moving and talking about math. In this download, you will receive 36 cards for the game. Vocabulary words are printed on one side of each card, and definitions are printed on the other. General instructions for set up are included. Never played Quiz Quiz Trade? 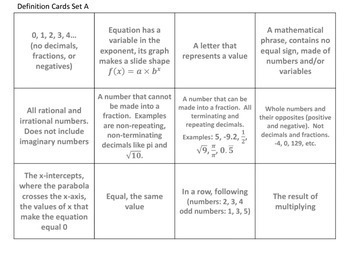 Begin by giving each student a card. In this version, vocabulary words are printed on one side of the card and definitions are on the other. All students stand up and raise a hand to begin the game. Each student should find another student with a hand up. Student 1 shows the vocabulary word on his/her card (Quiz). Student 2 defines the word. Student 2 then shows the word on his/her card (Quiz). Student 1 defines it. Then Student 1 and 2 switch cards (Trade). They raise a hand to find a new partner, beginning the process again. Also, students could show the definition side and guess the vocabulary word. Check youtube for some great Quiz Quiz Trade videos if your class has never played before. They are great for test prep! Thank you for your interest in this product from Rise over Run.